This is a great site....Just answer & post questions to be paid....earning rate depends on posted QUESTIONS QUALITY......Paying 2 times a month through PayPal.....Minimum payout is only $0.05... WARNING:DO NOT POST MATH QUESTIONS. MATH QUESTIONS WILL BE DELETED. DO NOT POST OBSCENE PICTURE WITH QUESTIONS. VISIT THEIR FAQ SECTION FIRST. Hi Dear, Yes it is true that this is a good site and pays twice in a month, but earnings are very slow and you need to be active there daily or your earnings will get decreased at faster rate then you earn. I have one some sites, where you can reach payout within 15 days, let me know if you are intrested, will share the details with you. PM me for the details. Yes agree with you, but recently facing issues with Pickjack, no matter how much question I answer correctly, the count is not decreasing and I am unable to post any question, my balance has got reduced from 19cent to 5 cents. So got frustrated and not working on that site lately, may be will try some other time again. yeah... its true but i'm having my problem on that site which is i cannot post questions eventhough i answred the required question 2 be answered,, any help? how long did you do in pick jack?..anyway thanks for opportunity and sharing..happy mylotting.. I am a member of pickjack too,but i think the earnings are very low in the site.I have tried it many times,but does not find the site worth wasting time and energy.I have stopped visiting the site altogether. I agree with you. I am also a member of Pickjack and I have 70 trivia questions posted on that site. 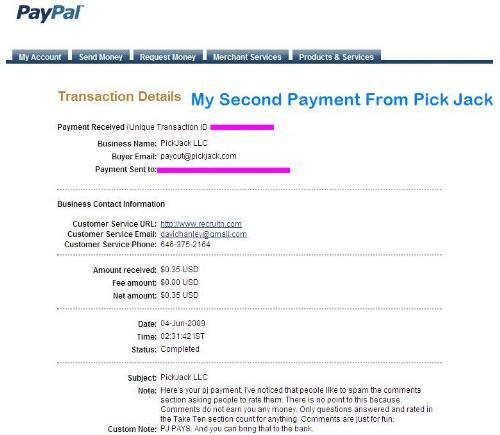 I have joined that site last April and I am continually being paid by Pickjack twice a month. I have been paid by Pickjack for four times already. You can also earn if you refer some new members, you earn from them when they also post trivia questions on the site. Happy earning!